My paintings have been described as creative, relaxing, and warm, while others are vibrant, powerful and fun. Viewers of my paintings often ask, "What is the story behind this painting? Were you ever there?" I then know that I have captured their curiosity, interest, and wonder. 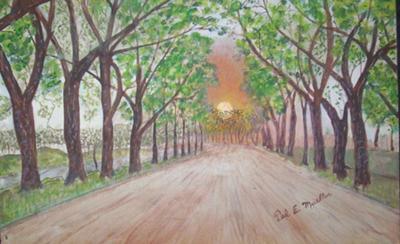 My journey into the world of art began in 1990 when, for the first time, I began to paint. Perhaps it was because I waited so long, or possibly it was in the seductive power of the paint itself, that I experienced the pleasure and calming sensation of the creative ideas and mental pictures that I was able to put down in paint. The great masters saw beauty in nature and were able to record their thoughts, feelings and love of their subject matter. Nature has so eloquently expressed the broad landscape of the world around us. A painting should be more than a representation of our immediate area. It should attempt to capture the spirit, and spark of life, and even the hidden feelings within the heart of the viewer. In my paintings I explore the emotion of the scene, the vocabulary that our creator has placed around us. 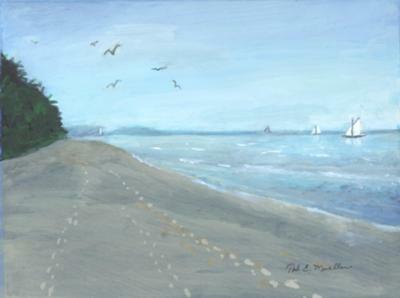 I endeavor to paint a scene as I feel at the moment, to capture the true sensation as I first saw that particular place. While an artist does not always achieve this, it is my ultimate endeavor to participate, to witness the magical moment when marks of color become a real scene. The greatest paintings I have ever made are still inside my head. Ted E. Mueller is an accomplished architectural draftsperson, designer, and teacher. 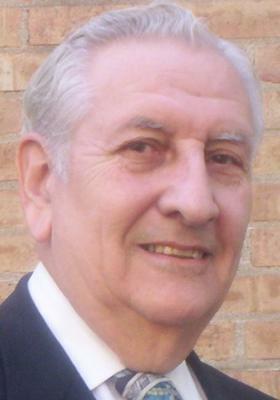 His lifelong career was working as a designer of home interiors and cabinetry, many retail stores and commercial buildings, plus an instructor as well. 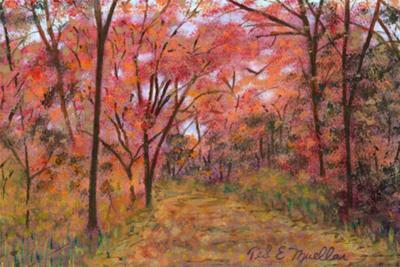 Upon retirement in the fall of 1990, he began his lifelong and unfilled dream of becoming a painter/artist. Although never having painted before, he searched for the best instructor he could locate. Initially, after interviewing her, he determined she was not the right person for him, but then decided to study with her anyway. But as often happens, first impressions are wrong. She was the guiding person in his painting endeavors, and Ted treasures her guiding instructions rendered during these many years. She saw his need for direction and guidance, and the talent was awakened early on. Landscapes became his special interest, and working from photographs and life, he began to record the visions he saw in his mind's eye. Ted is an inspiration to those who see and appreciate beauty around them. By following Ted's example of hard work and determination, you too can learn to express your love of nature creatively. Well done and thanks for sharing, Ted. Click here to return to Artwork from other countries. I was inspired when I saw a travel brochure about some city in Europe. 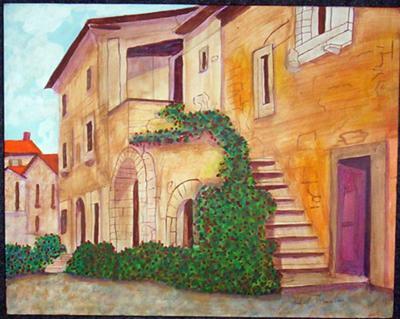 I do not remember the city or the country, but the small photo of a street scene was my inspiration. I selected an 18" X 24" stretched canvas, opened my acrylic paints, looked at the photo from the travel brochure and began. I outlined the buildings with a few sketch lines and could not wait to begin painting. The work seemed to flow from the brushes and I was amazed at the realism that followed. I set it aside, only to return and study it further. After a final look, I set it aside with the intention to return to it the next day. It was a week before I returned to it, and noted there was little to add as it was very detailed. The colors seemed to say it all. I stood back admiringly and said it is finished. The art assignment was to make a collage. Subject was at the discretion of the artist. My wife recently received her NEW seed catalogue for summer planting. So I copied several pages and printed them each in 6 sizes (scale). a watermelon = a gas tank. From there it was just to put the pieces together, and it ran from there. A healthy cycle. No hydrogenated oil. It was a fun project, and got many comments. 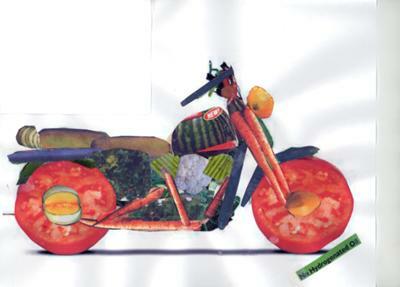 How many vegetables can you find? RIDE ON. - or is it right on? A tourist attraction in New Jersey is photographed by many. I saw a photo of it and was inspired to paint it as a gift for my son who lives in a town near Clinton, New Jersey. I painted it as an 8" X 10" acrylic, but also mixed in a water color method to achieve the desired realism. 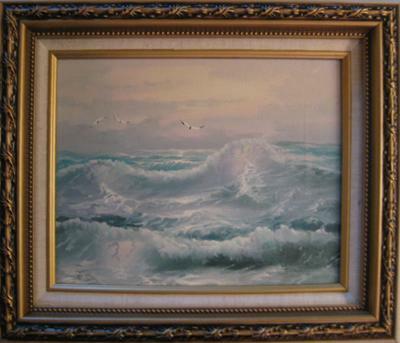 It is now framed and in his home in New Jersey. Katrina was a huge storm that devastated New Orleans. The homes are in the process of being rebuilt as many were either swept away by flood water or damaged severely. Brad Pitt formed the "Make It Right Foundation" and is assisting with the rebuilding of the houses. In suburban Chicago, some 30 artists decided to help, and formed a group called "I Artists". Their intent was to donate their original paintings to the cause, thinking this small gesture would help in 'making a house into a home'. The result is, collectively they made some 80 paintings, which will be reproduced and given as gifts to the families as they enter their rebuilt homes. Realize, there are about a thousand homes, so electronic scanning and canvas reproductions will be the ultimate gift to those devastated residents. Since New Orleans is noted for their colorful music, many of the pieces are music oriented. This piece titled "Pretty Music" was my contribution. I was asked who I thought was the greatest artist. I replied God. I pointed out that in the winter he coats everything in white, no two snowflakes alike. Ever study the beautiful frost that appears on a window? In spring the landscapes wake up, things green up and all colors spring forth. SPRING! Summer with so any colors, flowers and budding fruit. But in the fall, colors abound everywhere. My son sent me a photo of the Turnberry Lighthouse in Scotland. I was inspired to paint it in a different, but new, to me, style. I had a small piece of canvas about 9" X 14" and it seemed just the right size. Sketched out the proportions and everything just worked together for a satisfying piece. Using acrylics, I began, and employed a new style I observed from an Australian artist that I admired. The sky had to be blended colors, the shore line had to be just right. And then the lighthouse tower and adjacent buildings on such baren land just made it all come into place. I continued using acrylics which I watered down so they work like water colors. The effect/result are very pleasing and satisfying. I rolled up the canvas and mailed it to my son with a note. "The painting is yours, but you can get it framed." His response was just one word. "WOW!" Living near Chicago, we have access to view many scenes on Lake Michigan. 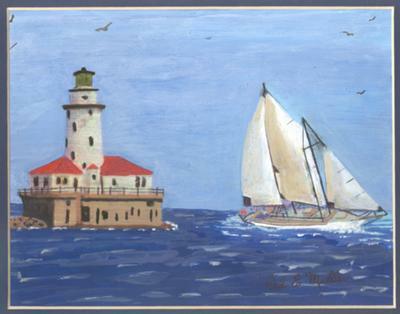 This painting is a composite of ideas; the boat is one that sails on Lake Michigan, whereas the lighthouse is one (someplace) on the East coast of the US. The boat is of a type that competes in the World Cup of races. 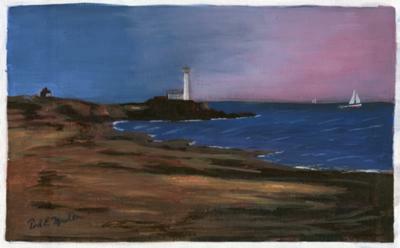 The light house is one I have painted many times in many different views. I work in acrylics and this was an experiment to treat the acrylics as water color on water color paper. I am well pleased with the results of the endeavor. This is one of 12 pieces that are part of a traveling exhibit of mine. 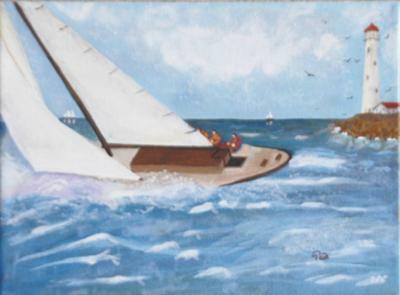 Originally titled "HIKING OUT", a sailing term meaning leaning way out to balance the boat, the title was changed when I was asked 'where is the hiking path in the picture'. Apparently the sailors' term went over their heads. About the painting: It is 8" X 10" on paper, using acrylics thinned so as to act like water color. An endeavor that worked out very well. If someone would like to suggest another title, I would welcome listening to suggestions. The challenge is open. I had painted this light house from a different angle some months ago, and decided I wanted to use a different vantage viewing point. I liked this view more because it shows the rocky shoreline, and a better viewing of the house and the tower. A comment I received was that I had even included the graffiti on the rocks. I replied that is my signature on the panting. 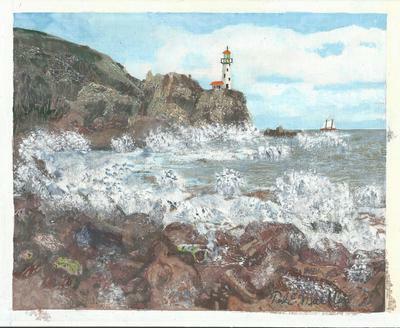 Made a copy for a pastor friend since he has told me that his grandfather was this light house keeper, many years ago. 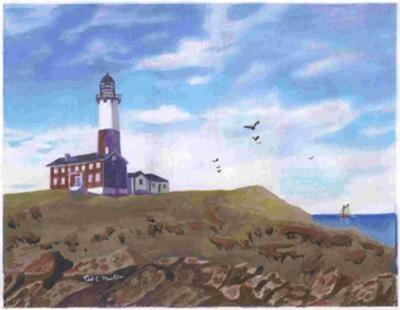 He also has the original of the first painting that I made of Montauk. 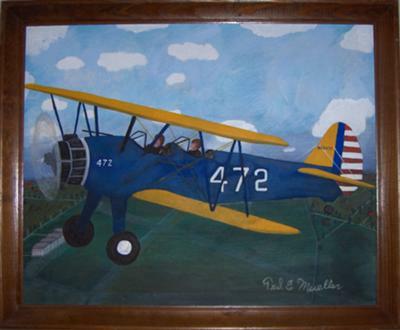 The painting is an 18" X 24" framed canvas of a 1942 Stearman PT-17; the PT designation means primary trainer. Lloyd Stearman was the designer, but by the time the military contract was awarded, he had sold the company to Boeing Aircraft Company in Whichita, Kansas. Boeing built this plane in November 1942, one of about 10,000 of this model built during the 40's. Wally and Cheryl Falardeau purchased it in 1979 and have experienced many enjoyable hours flying it from their home near Rockford, Illinois. I had a short ride in it and was taking a college painting class at the time. The painting assignment was to paint a landscape on an 18" X 24" canvas, so I painted an aerial view of the airfield. Upon completing the assignment, I decided to add an in-flight view of the PT #472 to it. Even painted Wally in the rear cockpit, and myself in the front cockpit. 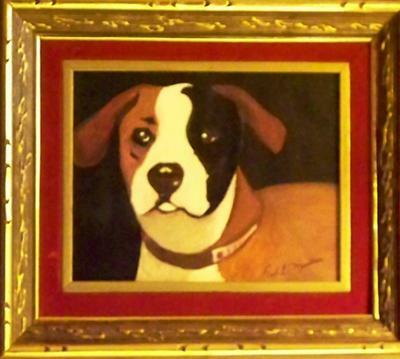 The painting was given to Wally and Cheryl, and it hangs prominently in their home. A bit of history of this plane: It was built in November 1942 and started its life as a trainer at Carlstrom Field in Arcadia, Florida. After WW II it was sold as surplus and began a new life as a crop duster, serving in that capacity until the early 70's, when it was converted to recreational use. Wally and Cheryl purchased it in 1979. I had admired a very deep/thick 3D carving in my church's altar for over 10 years. I studied it and investigated it, noting it is about 8 feet wide. Pastor informed me it is over 130 years old and was in the church's altar in their original sanctuary when the church was a wooden building. What impressed me was the disciples were all around the table, not just on one side of the table as most paintings of The Last Supper illustrate. 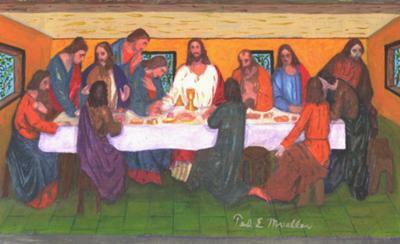 About a year ago I was determined to reproduce The Last Supper on a canvas. After many weeks, I finished my challenge and showed the finished painting to a professor from The Art Institute of Chicago for comment. "Perfect" was her reply, as I recall, so off to a framer for the finishing frame. The framed painting was presented to IMMANUEL LUTHERAN CHURCH, in Elmhurst, Illinois, USA where it now hangs prominently in the narthex of the church where anyone entering can see it. I am a perpetual college student, having been at our local college since about 1990. I keep taking painting classes so I can develop a style of painting. The professor I selected is a graduate of Chicago's Art Institute. She has several degrees and certificates including one from Italy, where she studied the art of making frescoes, wet paint in wet plaster. During summer 2010 she taught a 3 day class on sculpture. Had a live model and made a 3D sculpture. Every 10 minutes the model turned 45 degrees and we were to sculpt what was before us at that time. The study made one conscious of depth which I now utilize in my painting. As I said I have been studying with "Jenn" these many years. A bit of background on her: Upon her graduation (at age 22) from The Art Institute of Chicago, she was hired to teach there, which she did for 17 years. Then about 1990 she became a professor at the local college, and I have stuck with her all these years. She is so inspirational to all her students. Her critique of the errors in a painting and then the solution or the correction for perfection. I attribute my progress to her great method. "Peyton" was a request portrait commission job, because the buyer had seen a previous work of mine. Sculpting made me aware of 3D which I visualized in painting this beautiful dog. I watched Keith Norris demonstrate using acrylics as water colors and painting a beautiful landscape. I watched his video several times and decided I wanted to try this technique. I liked his selection and composition and decided to try this same picture. His style is unique, and was so easy to repeat his painting. I decided to entertain mixed media and so combined his water color technique plus straight acrylic. Then I decided to go one step further and looked at the trees. I wanted them to achieve a 3D appearance so I added white silica sand to the wet acrylic, layer after layer. This gave me the desired texture and then with multiple colors achieved the desired tree trunk effect. Then I read with sad heart of his passing. Please convey my sympathy to his family. I cherish his style, and submit my copy of his beautiful painting. 2" X 3" photo of a tree lined path. I took this and created my vision of such a path beside a small stream of water and imagined myself walking down this path into a sunset. I looked at a sunset and imagined the array of colors that would enhance this setting. My vision I then transferred to an 18" X 24" canvas and using acrylics and this was the result. It all seems so restful and sublime. Now I will be searching for just such a restful place of Solitude. Our group was having a fund raiser for "The Infant Welfare Society of Chicago". The theme - title - of course, 'Baby Baby'. The challenge was to paint an inspiring piece based on the theme. There were many mother-child paintings. 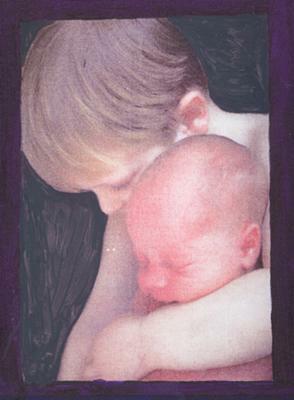 I saw an illustration someplace and the impression stayed with me as being appropriate for the occasion, a youngster holding his new brother/sister. Sadly, I did not finish the piece in time to be part of the exhibit. However, some weeks later, our group had another showing and exhibit, and I offered to display this painting then. The title of this showing was "Baby Baby Baby". Both shows were a success, and I was thrilled to be included in the exhibit. I love to paint light houses, but I insist that my view must be a sailor's view. 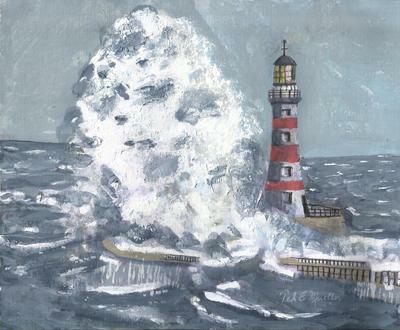 Many light house pictures and paintings do not show any water, and water's a must for my paintings, there must be water. A light house was a sailor's warning, a safety view of a safe harbor, and to steer them clear of dangerous waters where their ships could suffer harm or be damaged. I have created two versions of this painting. The first was a small 8" X 10" acrylic on canvas. A pastor saw it and requested I make him a copy but he wanted it to be larger, like maybe 18" X 24" on canvas. This is the smaller version as I do not have a copy of the larger version. Another pastor wrote a beautiful sermon titled "SAFE HARBOR", which I cherish. As a lifetime resident of a Chicago suburb, I always enjoyed the trip to Chicago's lake front, and looking out over the waters of Lake Michigan, and see this elegant lighthouse. It is located about a mile out into Lake Michigan, directly east of "Navy Pier", another Chicago landmark. I attempted to capture the feeing a sailor feels as he sails near the lighthouse. Lake Michigan can be a very treacherous body of water with a sudden weather change. To convey the feeling of choppy water was the challenge and I have received comments that the boat seems to me moving. Do you feel its motion? Recently I saw a small picture of an "Indian Mounds" site in IOWA, a state on the mainland of U S A. The photo was in the travel section of Chicago's Sunday newspaper. 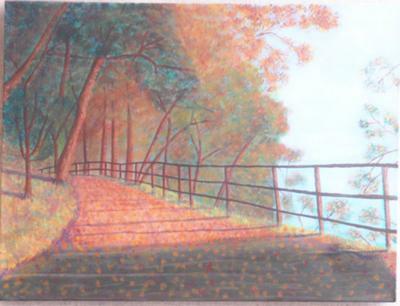 Though it was a small picture, it so inspired me with its quiet and restful portrayal, I just had to paint it. Indian Mounds are the burial sites of USA "native Americans". The sites date back many years and are protected sites by the U S government. The painting is 18" X 24" stretched canvas and was painted with acrylic paints. 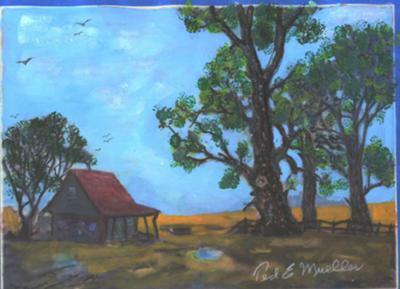 Currently the painting is part of a traveling exhibit of 12 pieces by artist Ted E. Mueller. I seem to paint a same subject twice, but each time different. 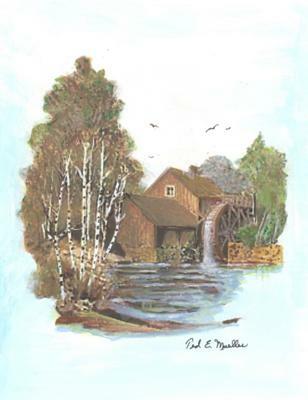 The first "Clinton Mill" I painted was a direct view of the side with the mill wheel. While working on that painting I envisioned an oblique view; One that showed two sides of the mill plus the water fall and many features of the building itself. A sketch and it flowed onto the canvas. Then I added a new endeavor I am developing, a 3D of an item in the foreground. This time a tree at the left, in a small island below the fall. I add silica sand to the paint, layer upon layer to achieve the rounded effect and make the tree step forward. The effect is startling as it seems to really be forward of the rest of the painting. A gift to my son who resides in a nearby town in New Jersey. The exhibit features eighty works of original art that celebrate the life, music, religion and culture of New Orleans, Louisiana. Chicago area artists forms 'IArtists', a not-for-profit organization, with the purpose of donating artwork to survivors of Hurricane Katrina. Fifty contributing artists are sharing their artistic gifts to beautify the homes of families who are rebuilding their lives in the city they love. Through charitable donations and profits from sales of the artwork, high quality prints are made and donated to the families. IArtists are working with Lutheran Church Charities 'Camp Restore' and Brad Pitt's 'Make It Right Foundation', who are building and restoring homes in the area. It is our sincere wish that the artwork will bring a sense of beauty, dignity and hope to as many homes in New Orleans as possible. We hope to donate to 200 families during 2010. Your $150 donation provides a giclee print to a New Orleans family in your name. 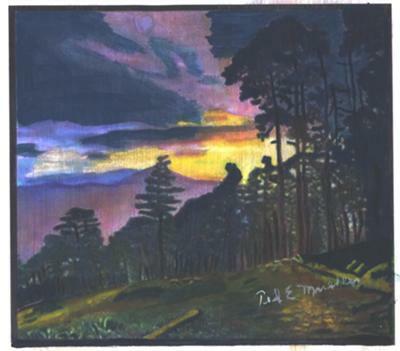 Your $75 donation pays for the initial scan of a painting. Your $25 donation pays the cost of shipping a print to a family. Many of the original paintings are for sale, please ask an I Artists Director about your favorite. IArtists Co. is a (c)(3) Public Charity. Your donation is tax deductible. Ever see a picture that seemed to call out to you - PAINT ME ~! This was the feeling I had when I saw a photo of Cooya Beach by Lucinda. The composition of the photo area was exquisite. Placement of horizon was perfect. Everything was picture perfect. This was my inspiration that brought Cooya Beach painting onto a canvas. It has been sent on to Lucinda as a gift from a friend from the other side of the globe. I visualized this garden scene which is so quiet and inviting. I can imagine sitting on the bench and watching the fountain as it bubbles and cascades over the bowls. It has a calming air about it. Walking down this path was so calming and enjoyable. I made two sketches: one on paper and one in my mind's eye. A canvas selected and the scene appeared just as I had seen it that late summer day. Leaves had fallen and more were soon ready to fall. I enjoy landscapes and rural scenes. I saw photos of this popular tourist destination and the inspiration was immediate. This mill is along the Blue Ridge parkway in Virginia, and a simply 'must see' location. 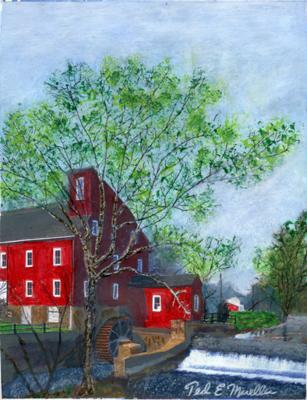 There are many thousands of photos of this mill and upon seeing some of them, I had to paint it. I decided to use mixed media, acrylic paint and water color, and it would be best on water color paper. The result is here for your enjoying viewing. I wanted to create a sea scene illustrating a rough sea. I felt this fully illustrates the feeling of such a scene. I thought it is a fitting follow up after painting "Cooya Beach". The painting was offered as a "silent auction" to help with school tuition. "Karen and Bill" purchased this piece and it now graces their home. My contribution for the on-going project of "Katrina" storm victims. 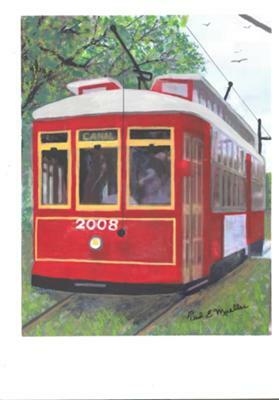 New Orleans is famous for many things, including their street cars. I wanted to show one of their famous street cars and Canal Street is one of them. This painting will also be donated to the rebuild effort so that this small contribution may be the little thing that helps make a house into a home. As a teenager, I would spend many of my summer vacation days at nearby Columbus Park, named after the explorer. The park had a shady path about a mile long, encircling the park. I would bicycle this path many times and when tired and warm, I would rest at a drinking fountain. Near by was a waterfall, so I would lounge there and cool down before venturing back home. Some months ago I was researching Jens Jensen, a landscape architect that had created many of Chicago's city parks. In early 1900's there was a design expression called Prairie Style that celebrated the Midwestern natural landscape. Jensen was also a friend of architect Frank Lloyd Wright another promoter and innovator of Prairie Style. Jensen designed Columbus Park with Prairie Style, using available local materials and landscaping vegetation. It had rolling terrain, as though remnants of the ice age, a lagoon with rental row boats, and a golf course. My favorite rest spot was a waterfall, which fed the lagoon. Here I could rest, cool off and dream as children do, and pass away my vacation time. 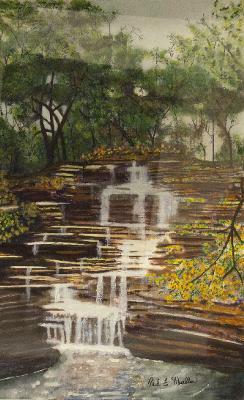 From my memories (of long ago) I sketched the waterfall. Later I contacted the 'Department of Planning and Development of Chicago Parks'. "Julia" sent me several photos of the waterfalls. I painted it with acrylic paint on watercolor paper. The result is here for your viewing pleasure. 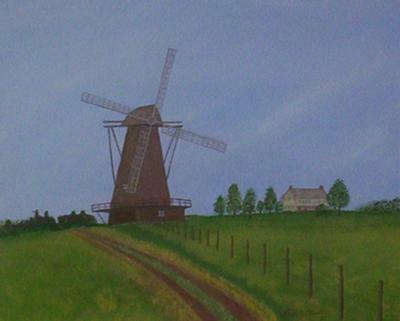 Some 20 years ago, I made one of my earliest paintings depicting The Heidemann Mill, of the Village of Addison Illinois. Constructed in the 1865, it was destroyed by vandals in a huge fire in 1958. Addison had a volunteer fire department, and by the time they arrived, the mill was a total loss. The windmill is Addison landmark logo. Prior to painting this picture I had spoken with Gus Heidemann and several members of the surviving family. Gus was some 94 years old at the time but his memory was sharp. He told me how the mill was constructed and its purpose to grind wheat, corn, and buckwheat for the then farms and farmers in the surrounding area. Gus detailed how the massive oak wind beams were constructed and the purpose of the grid ladders. The ladders were so that the mill operator could attach "canvas sails" and be able to climb up each paddle to accomplish this feat. He told of the huge 6 foot diameter by 18" thick mill stones imported from France for the grinding operation. The entire top portion, the mill cap, rotated 360 degrees, to catch favorable winds from any direction, and turn the massive 72 foot wings. When the painting of the mill was completed I showed it to him and other family members. "Where is the house?" was the question. "Oh, the house has to be included in the picture." With no photos available at the time, they described the house and its porch. The house was about 100 feet from the mill. So from their description, I sketched the farmhouse for them. "That's it," was the exclamation. So back to the paints and brushes and added the house to the painting. With the house added, I showed it again to the family. They were pleased. At the time, I was a student at the local Community College, taking a painting classes. 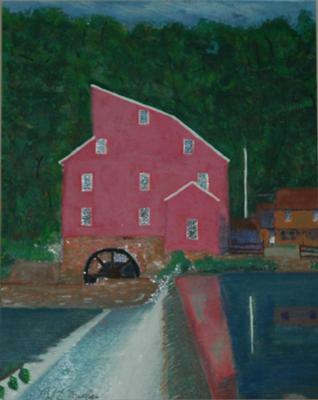 When the instructor critiqued the painting and heard of my lengthy research, I was asked to prepare a 20-minute lecture about the "history and construction of the mill" and the research to make the painting. I received two "A's" for my effort. One for the painting, and one for the lecture. When the Addison village clerk heard of the painting she asked to see it. Upon seeing it she requested I donate it to the village to be displayed in the village hall, where it hung on the wall behind the switchboard operator. About a year later, the switchboard operator expressed her dislike of the painting and insisted it be removed. With that request, the village clerk complied but said it would be placed in storage and later to be displayed in a soon to be constructed "Historical Museum", in a typical farm house of the era. 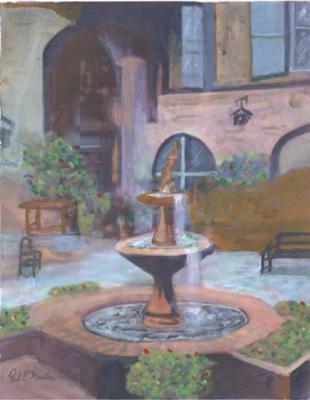 The painting now resides in the Addison museum, called "Century House", where visitors can enjoy seeing it. Our adult group planned a "Luau" party. I offered to make a painting for it, and promised it would be a surprise. 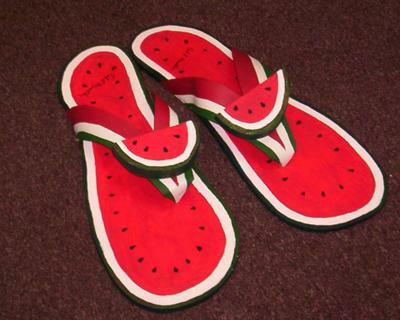 Wanting something different, I cut out a pair of 24" flip-flops and began painting them. First I painted them with a series of gala colored stripes. I did not like the result. Next I painted a bare foot on the surface, and again did not like the outcome. FOOD ! The theme is FOOD. So I painted huge slices of watermelons. I liked the result. So I added split slices of melon for the straps and a wedge slice of melon atop the straps as a flower would have been. The pair was hung in back of the food serving line and received many compliments. Guess it was a one of a kind thing. 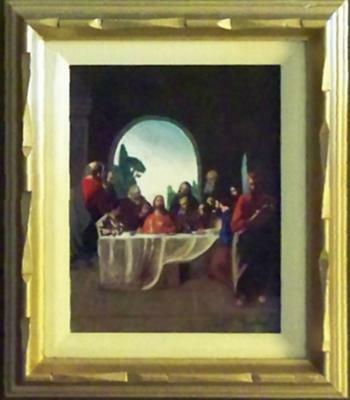 Some time ago I saw a picture of "The Last Supper", and admired the composition of the painting. The apostles were around the banquet table and Judas had been identified as the betrayer. The painting depicts Judas leaving in shame. Having studied the painting, I decided that I would attempt to paint it also, so selecting a canvas I began. The result was pleasing. A complementing gilded gold frame with an antique band insert was selected by my framer. The painting was presented to IMMANUEL LUTHERAN CHURCH in Elmhurst, IL., USA in September 2010, and is displayed near the entrance for all to enjoy during their visits. Grandson wedding day and photographer's selection of a site for a memorable occasion. This scene was selected by them for a thank you card cover. I was impressed by the card and it inspired a challenge to make a painting of the site and event. Though I prefer landscapes, inter-composing a portrait into the painting was the challenge, and to get it just right. 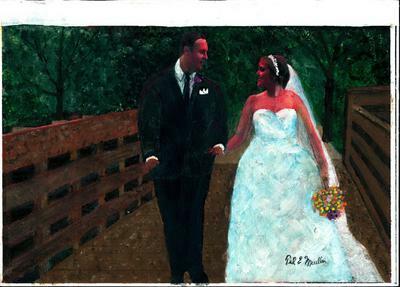 This painting will be a gift to the couple to remember that day and their Grandpa. Six years ago, I was involved in a serious car accident. Early on a Sunday morning, while waiting for a traffic light to change, a woman, supposedly asleep while driving on this 45 MPH highway, plowed into he rear of my stopped car. I had a very large Buick Roadmaster and she had a small Toyota. The impact pushed me across the intersection, which because of the time was empty. The impact pushed my car across the intersection. She was all the way into the back seat of my car. The impact broke my driver’s seat and I was also in the rear seat. I had such a firm grip on the steering wheel, that my bicep muscle of my right arm was torn from my forearm. My right arm was just hanging, pain was excruciating, and I could not move my arm. A sports specialty surgeon examination followed and surgery was not advised. It would be counter productive. The muscle could not be reattached to the tendons which remained attached to the bones of the forearm. I am right hand dominated, meaning I am right handed. I paint with my right hand. So I ventured to a chiropractor that specialized in such treatment. After his examination he advised that there is a small muscle that is beneath the bicep muscle and he could “wake it up”. I went through 91 such treatments, 3 times a week for some 6 months. I had regained partial use of my right arm, but could not paint on an easel anymore. I could not hold up my arm to paint. I conferred with my college professor-painting instructor, and she offered to teach me to paint with my left hand. This was not for me. Then she suggested placing the canvas atop a table, and by resting my arm on the table, I could paint. She also went to far as to procure a high stool so I would be more comfortable. It was workable and I could paint. So I painted that scene for him. 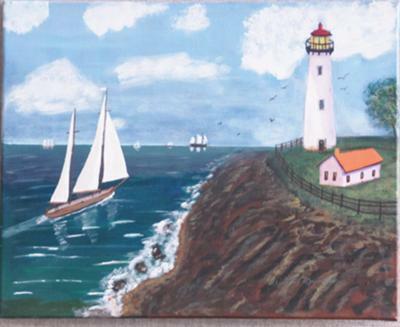 And while I was painting that picture, I began painting “Split Rock Lighthouse” which is in Minnesota USA). He was pleased with the result and seeing Split Rock Lighthouse offered to purchase both of them. Long story short: Soon after, he redecorated his office suite, and there in his reception area is his expensive light house, and hanging each side is one of my paintings.